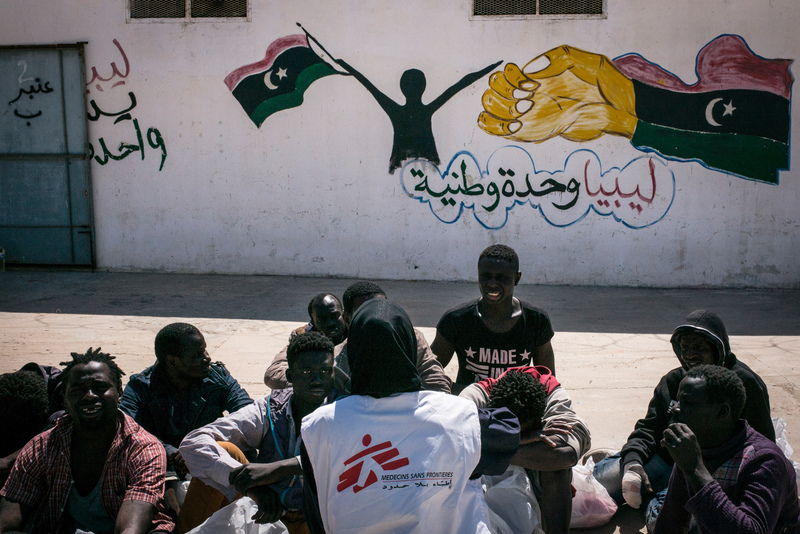 Médecins Sans Frontières/Doctors Without Borders (MSF) continued to provide lifesaving and primary healthcare to refugees and migrants detained in the Libyan capital, Tripoli, during the first quarter of 2017. More than 4,000 medical consultations took place in seven different detention centres nominally under the control of the Directorate for Combating Illegal Migration (DCIM). Around 1,300 people in detention were treated every month via mobile clinics for conditions including skin disease, diarrhoeal disease, respiratory tract infections and urinary tract infections. These preventable diseases, as well as acute malnutrition, are the direct result of detention conditions. Conditions inside the detention centres do not meet any national, regional or international standards. The food provided inside detention centres is often not sufficient in quantity and quality. In the first three months of 2017, interruptions in food supply were observed in two detention centres, with detainees going for days without any food. As a result, our teams are treating adults suffering from malnutrition. There were 13 acutely malnourished patients in our therapeutic feeding programme in January, 19 patients in February and 20 patients in March. The number of detainees being held in each detention centre fluctuates significantly. With no rule of law in Libya, people are held arbitrarily and it remains unclear exactly how the detention system functions. People appear from one day to the next after being intercepted at sea by the Libyan coastguard, arrested on the streets, rounded up in night raids, or brought to a detention centre by individuals. Detainees are suddenly released overnight, or moved to an undisclosed location. Confining a large number of people in a small space causes musculoskeletal pain and allows for transmission of diseases and infections such as scabies and chickenpox. The number of infectious respiratory diseases is also directly influenced by poor ventilation. Although the overcrowding has improved somewhat, our teams observed overcrowded cells throughout the entire first three months of the year. Detention has a direct impact on the mental health of detainees who have no immediate prospect to improve their situation, and often no idea why, or for how long, they will be detained. A large number of detainees suffer from hypervigilance, a condition where people are preoccupied with scanning their environment for possible threats and are easily startled. Many detainees have suicidal thoughts, difficulty sleeping, exhibit symptoms of post-traumatic stress disorder (PSTD), and suffer panic attacks, depression and anxiety. We run psychosocial activities in detention centres and carries out individual counselling sessions. Our teams also provided psychiatric treatment for 17 patients during this period. We are treating violence-related injuries including visible scars, bruising, and lacerations. Five people were treated for these in January, eight people in February and three people in March. In the event of a medical emergency, we will attempt to refer people to hospitals in Tripoli. During the first quarter of the year, we referred more than 53 people who urgently needed specialised medical care. Each referral is very complicated and time-consuming to organise. Many hospitals do not want to admit detainees. Access to sufficient and safe drinking water and access to latrines and showers is vital to counter diseases such as skin infections and infestations with lice, scabies and fleas. In most detention centres we visited, daily water availability now meets or surpasses the minimum quantity for drinking and washing. We have installed water tanks, distribution pipelines and taps in several different centres, in an effort to improve the water quality and unhindered access to running water. These distribution systems are regularly inspected and maintained by our teams. Despite these improvements, frequent power cuts and water shortages in Tripoli mean it is difficult for detention centres to maintain the supply of water during periods of limited availability. There are only limited possibilities to truck in water. Unhindered 24-hour access to toilets is not facilitated in all centres. We have made efforts to improve hygiene conditions inside the centres and assists with supplying personal hygiene items to all detainees, as well as soap and cleaning materials to keep the premises clean. But detainees do not always have unhindered access to the materials distributed and sometimes items are confiscated. The medical care we provide takes place within a highly militarised environment. The daily lives of our patients are strongly controlled. Our doctors are not always given full freedom to triage patients or to decide which patients get to see us. The privacy necessary for medical consultations is not guaranteed. In some detention centres, officials do allocate a designated area for our doctors to conduct medical consultations in private but in other detention centres they do not. It is a difficult choice for us to work in an environment where people are kept in conditions without human dignity. However, our hope is that, by being present and providing medical care, we can improve the conditions of detention and alleviate the suffering experienced by detainees to some extent.